– Codorniu (Casa Codorniu 1898) ? 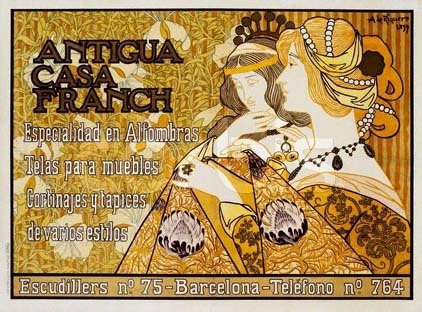 The poster began to have a special importance at the end of the nineteenth century as the medium of a new aesthetic. In this process, Riquer’s work, together with that of Ramon Casas and Adrià Gual, would play an essential role. 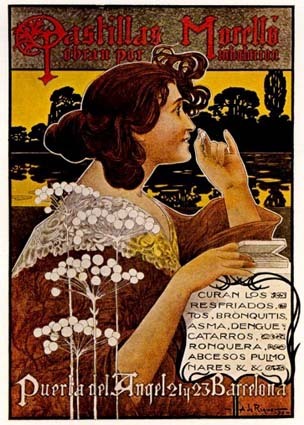 In 1897, Riquer presented a poster for the Saló del Pedal that reflected a refined symbolism of the greatest elegance, as much for the quality of his idea as for his realization of it. The poster grew in importance as an element of commercial advertising. All types of products – food, drinks, medicine, furniture, events, vehicles – came to be announced through this medium. 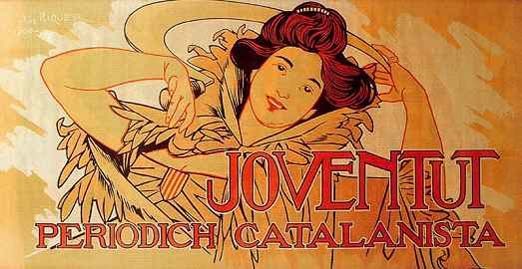 Riquer, Gual, and Casas frequently used as a central element the female figure accompanied by curved forms, characteristic of the Art Nouveau, along with depictions of natural elements, usually vegetal. 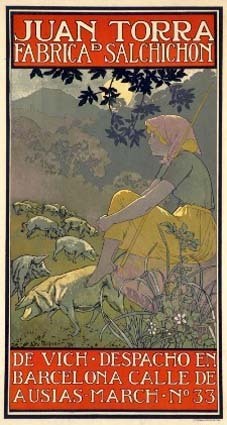 The motifs represented in these posters are further characterized by an image of vitality that exalts youth, life, and whatever is positive: the rising sun, happiness. To select posters, advertisers quickly turned to the system of competitions, which allowed them to choose from among a wide variety of proposals from renowned artists. 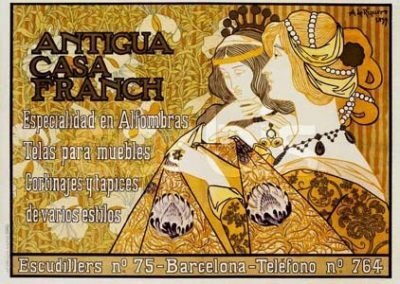 For example, in April 1898 there was a contest to design a poster for “Anís del Mono”, in which 162 proposals were submitted. 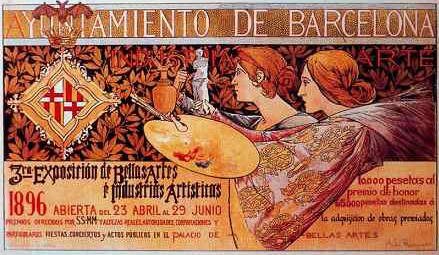 Ramon Casas’ design was selected, and Alexandre de Riquer’s design won second place. 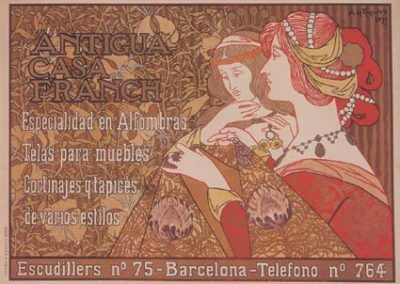 Riquer’s poster production was quite extensive, and his creations in this field were always well received. Reflection on what is now considered a veritable artwork allows us to enjoy the ethereal forms so characteristic of the Art Nouveau period. 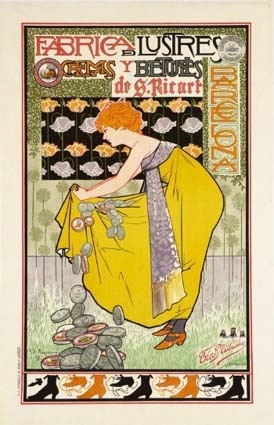 His merits as a poster artist and designer were recognized in several European publications, including The Poster Collector (1899), Circular (1899), The Poster (1899), Les Maîtres de l’Affiche (1899), and The Studio (1900). 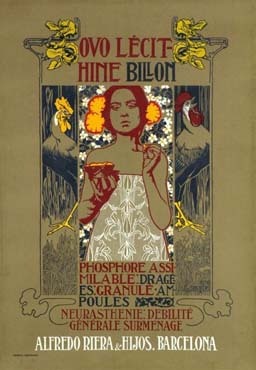 Seen from a wider European point of view, it has traditionally been considered that Riquer’s poster work was influenced by the Czech Alphonse Mucha, but Eliseu Trenc has posited more recently that the influences of Belgian poster artists Edmond Meunier and Privat-Livemont are much more apparent in Riquer’s work.